This is a simple statement with profound implications. Everything in the universe is made up of atoms and molecules, contains information and vibrates at a certain frequency. But most of us go about our daily lives not really thinking about the fact they we are energetic beings with a human energy field (EF) surrounding us. After all, we feel solid. We have bones, muscles, organs, glands and blood flowing through our arteries and veins. But we are 100% energy – just like animals, plants, rocks, mountains, buildings, and books. Even your thoughts and emotions are a form of energy. Positive emotions like love and joy have a high vibration and negative emotions like fear, guilt, anger and self-doubt have a low vibration. Energy flows and attracts and is influenced by other energy. It is well documented that stress is linked to disease. We are bombarded each day with negative energy such as news stories about violence and war, pollution, stress at work, your own negative belief systems, addictions and even poor diet choices. If you are like most people, by the time you are in your early twenties (source: Caroline Cory), you have had years of programming your cells with thoughts like, “I am not wanted,” “I am responsible for my parents’ divorce,” “I don’t fit in,” “I’m confused about my life purpose,” and “I’m not good enough”. This negative energy gets registered in our bodies and damages the DNA in cells. Over time, it can lead to disease. 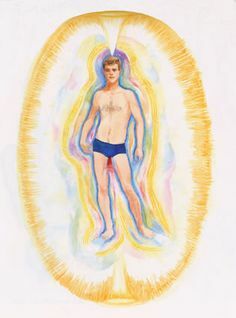 Chakra 7: Top of head Muscular & skeletal system, skin Values, ethics, courage; faith and inspiration Chronic exhaustion not linked to physical illness; extreme sensitivities to light, sound, etc. You can reverse years of negativity and heal through acts of forgiveness. Identify negative thoughts and emotions and work towards forgiving yourself and others. Release any guilt. Take a step back and look at your life symbolically. When bad things happened, what was the larger lesson you learned? Perhaps you were meant to experience an addiction, illness or job loss to help you learn forgiveness, patience, resilience and courage. Perhaps it led to changing your lifestyle or career which ultimately made you happier and more fulfilled. Humans have over 60,000 thoughts per day (source: Caroline Cory). Avoid dwelling in fearful thoughts or making decisions based out of fear. According to Abraham-Hicks, “by the Universal Law of Attraction you are attracting the essence of whatever you are choosing to give your attention to – whether wanted or unwanted.” Instead of worrying about something or someone, visualize what you want to see happen. Trust your emotions and visualize circumstances that bring you joy. Take time each day to give thanks for what you are grateful for – for being here on the earth at this time; for your body, mind and spirit; for your family and friends; for your talents and interests; for your career and abundance, etc. Count your blessings rather than focusing on what’s wrong in your life. If you are open to it, begin or continue a meditation practice and tap into the ultimate energy – of unconditional LOVE. Meditating raises your vibration and can help restore your cells to their original DNA. Listen to Connecting to Source (free on YouTube and only 8 min.) from Caroline Cory to experience complete relaxation, healing and to raise your vibration. Everything you put into your body is energy and has a vibration. In his book, Conscious Eating, Gabriel Cousens, M.D., states that “particular energies exist within each food that affect our physical functioning, the nature of our thoughts, and even the expansion of our consciousness.” He promotes a vegetarian diet that “brings us into harmony with the principle of non-cruelty to animals, the universal laws of nature, and food-related ecological issues, thereby enhancing peace on our planet.” More on this after I read his 852 page book! I hope you’ve found this topic on energy and energy healing as fascinating as I have. Here are the sources I referenced in this post or that have inspired me that you may want to check out. Conscious Eating, by Gabriel Cousens, M.D. This entry was posted in Healing, Plant-based and tagged Anatomy of the Spirit, Caroline Myss, chakra system, Energy, Energy Healing, forgiveness, gratefulness, Human Energy Field (EF), meditation, Vibration. Bookmark the permalink. well detailed article. so easy to forget we are all energy and we can make choices about what kind of energy we become! What i take from this article is that positive emotions have high vibration and negative emotions have low. So I need to stay with positive emotions! Thank you! Thanks Mary! Excellent to know and remember! Reblogged this on Holistic Healing and Coaching. Nice article. Caroline Myss is one of my favorite teachers. I’m going to reblog your post. Thanks!